Creating a bee-friendly environment is a great way to help our pollinators; you get pretty flowers while helping to sustain the bee populations. Bummed about the bees? Me too. But aside from signing petitions and writing letters to local government officials to stop the use of neonicotinoids in pesticides and GMO seeds, I wanted to create a bee-friendly garden. An urban refuge, if you will, where our furry little bee buddies can come and take a break from the hubbub of life and gather a little pollen while they're at it. Creating a bee-friendly environment is a great way to help our pollinators; you get pretty flowers while helping to sustain the bee populations. 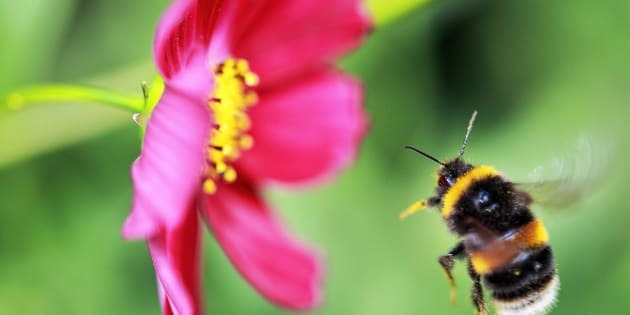 Research shows that planting bee-friendly gardens increases the number and diversity of bees. This is easy enough – just plant their favourite foods and don't use insecticides. If you have bug trouble, make a natural insecticide. Do we have some pesticide recipes for you? Damn skippy we do! Chrysanthemums contain a powerful chemical component called pyrethrum which enters the nervous system of insects rendering them immobile. Boil 100 grams of dried Chrysanthemum flowers in one litre of water for 20 minutes. Strain, cool and place in a spray bottle and use as a natural insecticide. One tablespoon of castile soap in a spray bottle filled with water (about 750 ml or 25 oz.) will work for most things. For an added punch, add 10 drops of any citrus oil (orange, lemon etc) as this helps it to stick to the plants better. Got stubborn borers like Japanese Beetles, or leafhoppers? Add chili powder (cayenne pepper works too) and a bunch of crushed garlic to the recipe above and spray those bugs away. Be sure to plant native plants first because they will attract local species of bees and will require less watering as they are adapted to local conditions. When you've brewed your morning cuppa, don't discard your grounds. Instead, sprinkle your leftover coffee grounds around your veggies to fend off mosquitoes, ants, slugs and maggots. They are also a great fertilizer for plants that like more acidic soil like rhododendrons and azaleas. Fungal Diseases? No problem! Just mix together 1 tablespoon of baking soda and 1/2 tablespoon of olive oil in two litres (two quarts) of warm water. Spray on affected areas and your plants will be fungus free in no time. When it comes to herbicides, we've got you covered too. Get the recipes here. Be sure to plant native plants first because they will attract local species of bees and will require less watering as they are adapted to local conditions. Many engineered flowers are sterile, so always plant organic flowers. Plant flowers in clusters in a sunny spot away from the wind. Some of the flowers bees love include wild bergamot, cornflowers, lobelias, columbine, Foxglove, coneflower, cosmos, sunflowers, lavender, dahlias, Michaelmas daisies, thyme, red clover, golden rod, sage, rosemary, catmint, lupins, black-eyed Susan, angel's trumpet, verbena, aster, and shasta daisy. Bees need to drink water and most bird baths are too deep. Instead, use a shallow drip tray or plate and place a couple of pebbles in that can act as islands. Fill the plate with a little water-just enough to evaporate by the end of the day. Not all bees live in hives. You can help to create homes for solitary varieties of bees using the tutorial here. Participate in the annual Bumblebee Watch to help keep track of bumblebee numbers and invasive species.